Since ancient times, India has been a home to the art of metal sculpturing and craftsmanship and has produced various methods to carry on the craft which are still prevalent all over the world. It has produced some of the greatest metal artisans of all time. But in the last few decades, due to rapid modernization, metal artistry in architecture has been on the decline, largely due to the time involved in the work. As a result the artisans have been losing work, forcing them to quit their ancestral profession in search of alternate ways of earning. This poses a serious threat to permanent loss of an art seeped in history. 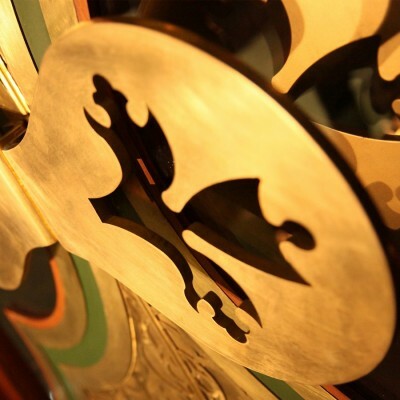 The focus of the project is to bring back Metal Art. 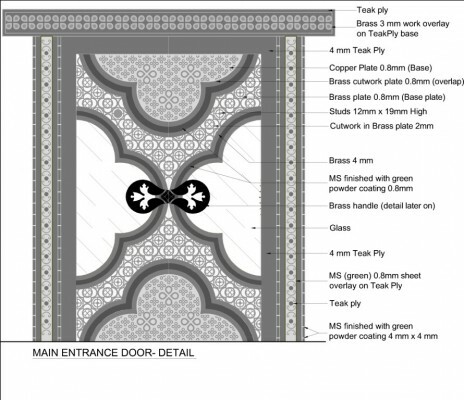 The aim of the shop is to display various applications of water Jet CNC cutting in architecture. The concept behind the project is to salvage art from the past and redefine it for the modern world. Revival and reinterpretation of the art would increase the demand of it, which in turn would generate work both for artisans and the machines. Symbols and motifs have, throughout history, been used as means of incorporating cultural expression in art and architecture. They have often been used as alphabets in the graphical language, a few of them being easily recognizable and commonly used. Their use, style, scale may vary but they can still be identified. 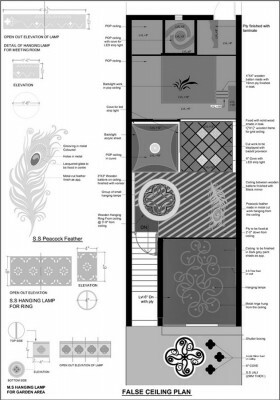 One such element has been used as the base element for this design. It is employed in various ways and in different places, usually as decorations, such as outdoor garden lamps, main door, flooring, ceiling works, wall panels etcetera. The decision to use the single motif as the main element throughout the store, creates a strong sense of unity and coherence in the entire design. 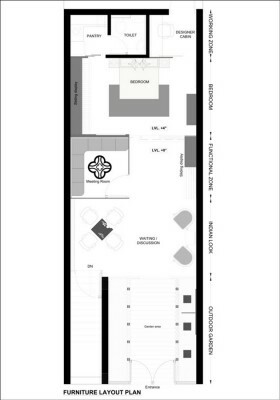 The space program dictated a separate area to be designated for an outdoor garden, interior furnishings and artifacts, space for discussion, display panels for variable display, workspace for the designer, a washroom and a pantry. A design approach was adopted wherein it was decided to develop experience centers for customers so that they could appreciate the synthesis of solids and voids integrated and forming the art display in itself. 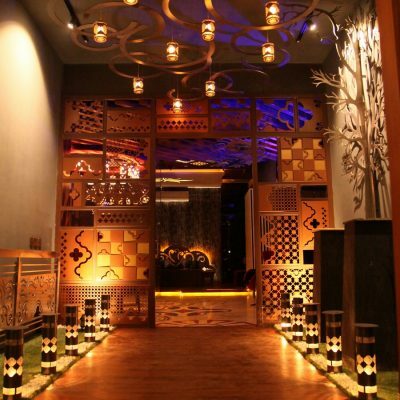 The store has four zones: an outdoor garden, an ethnic Indian zone, workspace and the interior zone. 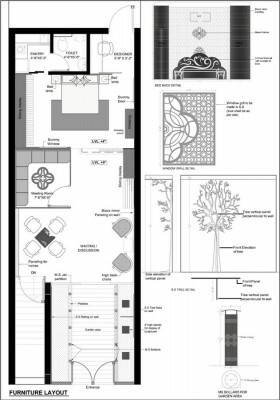 The transition between outdoor and indoor space is achieved using various ethnic and modern interpretations of the motif used in the interiors. Since the store is located in one of the bay shops, the main door opens onto the common corridor, which necessitated it being visually appealing to draw customers inside. 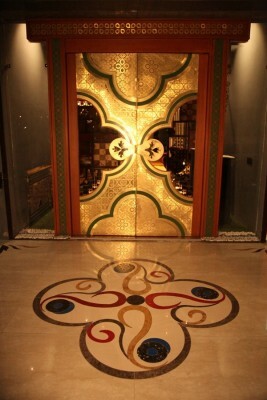 The entrance door, therefore, was made as an amalgamation of technology and tradition. Making use of ancient Indian metals of copper and brass, it was given a classical soul with a modern outfit of metal cutting. Manasara cannot, in the conventional sense, be called a ‘store’ or a shop. It is much more than that. Sitting in the midst of the common bay shops, it aims to redefine what interior architecture has the power to do, if used correctly. 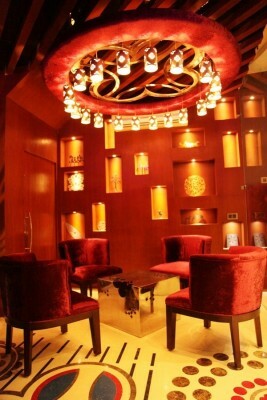 The idea behind the concept of the shop was derived from the history of metal art in India. The research and the study done for it lead to the realization that the art had a great influence over the architecture of the nation since time immemorial. But over time, its importance had diminished, mostly due to the advent of technology and hence, less time consuming techniques of using metals, which further lead to the artisans leaving their ancestral profession and finding other means of livelihood, putting the whole arena of metal art into jeopardy. What was required was to find a way to let the artisans display their works so as to generate interest in the art once again. The thought lead to the concept of designing the shop, not only as a retail possibility but also as a space to showcase the talent of the artists involved. This revolutionary idea lifted the design from that of a mere store to an art display center for water Jet CNC cutting in architecture. 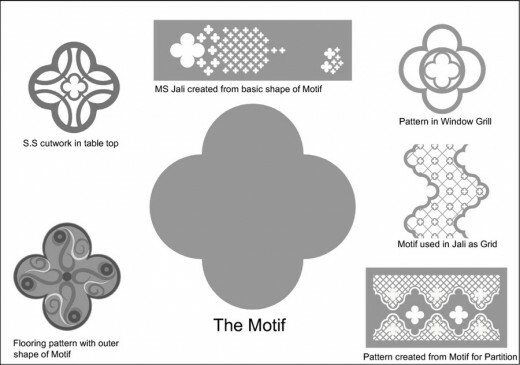 Out of the various symbols and motifs used as the graphical language in metal sculpturing and cutting, one was chosen and used as a repeating element in the whole design, its purpose being the unification of the interiors, bring about a fluidity and coherence to the plan. 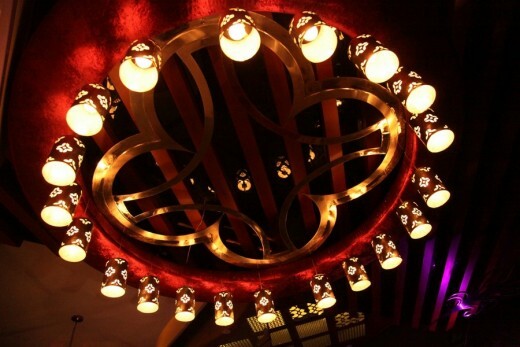 This particular symbol was used in places such as the garden lamps, the flooring details, ceiling design etcetera. Another design challenge was to make the shop front attractive and unique. Since the shop is located in one of the bay shops, the main door opens onto the common corridor, which necessitated it being visually appealing to draw customers inside. 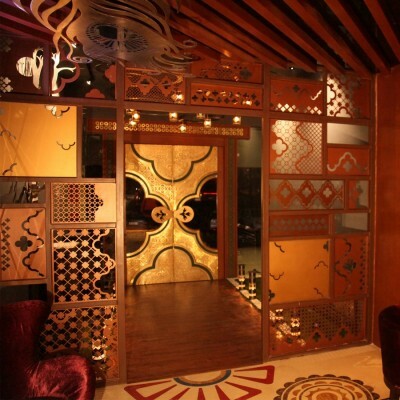 Therefore, the entrance door was made as an amalgamation of technology and tradition. Overall, the project was done keeping in mind the artists involved, in a way that allowed for a richer and unique user experience. 2. Material and Colour Concept. The client for the project had a lot of experience in 2D water jet cutting. Therefore, in keeping with his interests, it was decided to make use of metals like mild steel, copper, brass, stainless steel and also materials such as wood, MDF, stones etcetera. 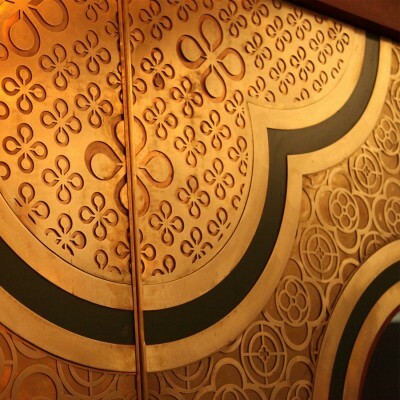 Even the entrance door was designed using ancient Indian metals of copper and brass to give it a traditional look with a contemporary twist. The plan was divided into four zones and each zone had a unique, individual colour and characteristic. 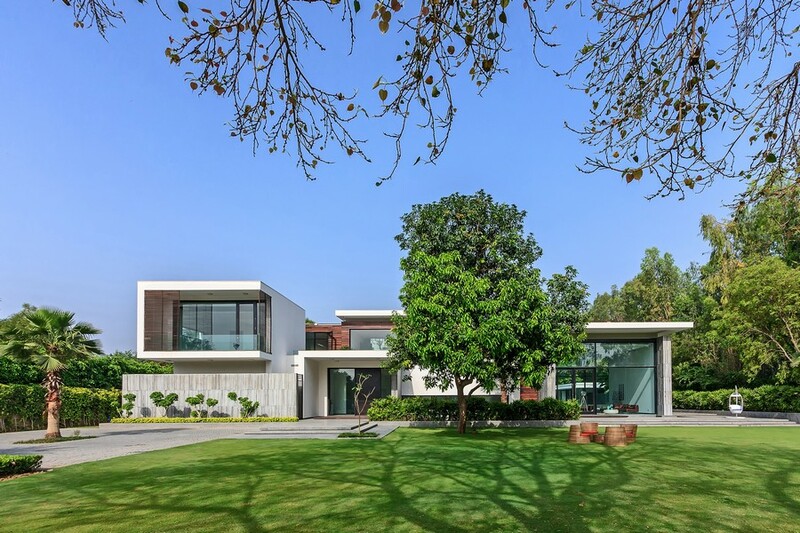 The first zone consists of the outdoor night garden area and utilizes black/grey colour tones with contrasting stainless steel trees and railings. 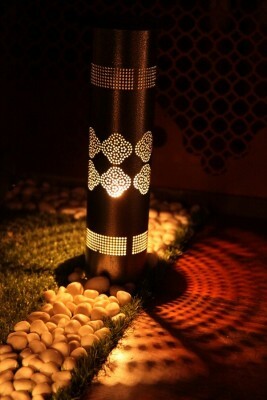 The colour extends to lamps and bollards (depicting clouds) to give it a wholesome look. The second zone brings to fore a traditional Indian look with hues of purple. Lilac fabric used in ceiling rings and furniture upholstery along with black mirrors (also on walls and ceiling) to add depth to the space and allow a luxurious and glamorous look. The flooring in this zone is inspired from the Indian art of Rangoli and uses vibrant coloured stones to achieve the desired effect. The third zone includes the workspace for the designers and again makes use of the soothing tones of purple, which is psychologically proven to help in concentration and focus. The upholstery is done in the same colour coupled with grey walls and light fixtures. 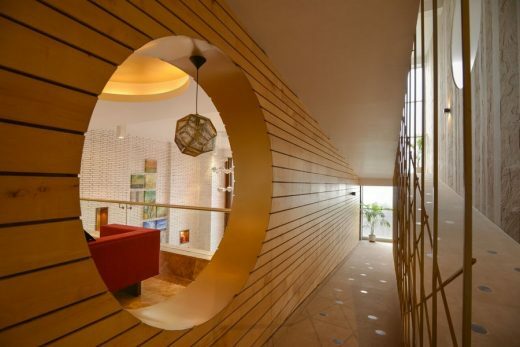 To provide a contrast to the walls, the ceiling is given the colour white. The fourth zone is dubbed as the Interior zone and contains beds and windows made of stainless steel. The walls are tamed with grey and a touch of wood in the doors and dressing station cozies the space. 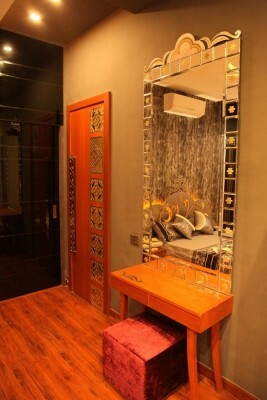 To enhance the special quality and add depth, black mirror has been used. In general, the colour tones are subdued and soothing. 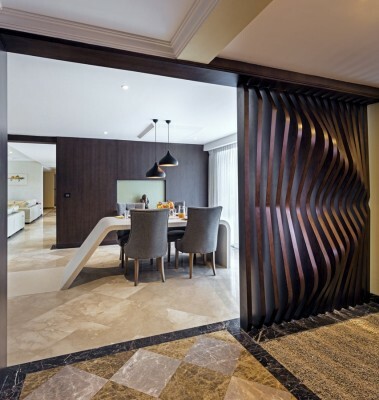 One of the most distinctive features of the design is the door which uses the metals, cooper and brass to bring out the intricacies of the ancient art of metal sculpturing combined with a modern, contemporary functionality. In addition to the metals, other materials such as glass, mild steel and wood are also used to create layers to the jigsaw pattern of the composition and add depth to the design. It was important that technically, the materials be handled according to the variation in their thickness, colour and joints. This also gives an opportunity for the artisans to showcase the extent of workmanship required for water jet cutting. 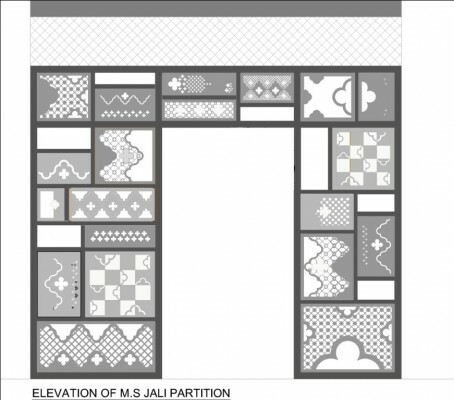 Similarly, the partition between outdoor garden area and the ethnic zone has been designed to show the transition between the macro and micro levels of patterns possible. The flooring pattern was designed in such a way so as to showcase the way varied stones in different colours can be used to generate a clean and aesthetic design pattern. Materials such as Italian stones, granite, composite stone, quartz and tiles were used together for various compositions used in the interiors. 4. Main Challanges Overcome while doing the Project. With the advent of new technology, a new dimension in creativity is introduced for a designer or an architect to work on. 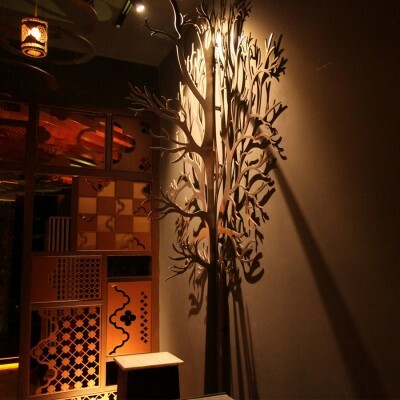 Cutting metal sheets with Water jet CNC machines is one such thing for interior designers. Having an experience in metal fabrication for industrial application, the client wanted to develop a display to showcase the possible applications of water jet cutting in interiors. Space constraint was a major challenge for the design team. 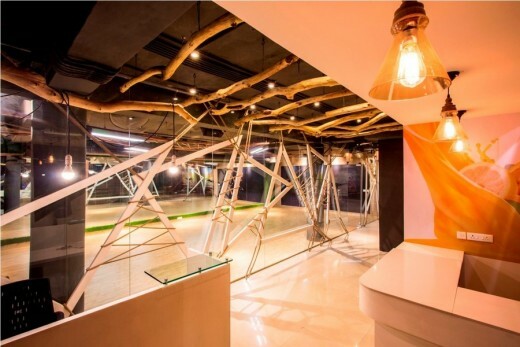 The entire program was to be fit inside a space of a mere 90 sq.m, while balancing aesthetics, concept and functionality. The solution employed was to divide the space into four distinct zones, each with its own individualistic theme and colour. 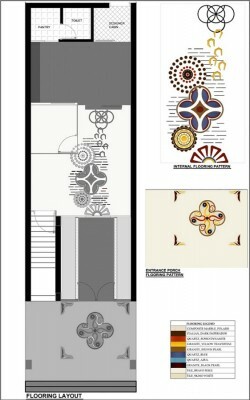 In order to provide coherence to the design and these four zones, a single motif was introduced. This symbol, chosen from amongst the various ancient depictions used in the graphical language allowed unification, diminishing chaos.